In this April 2007 file photo provided by the Tennessee Valley Authority, steam rises from the cooling tower of the single operating reactor at the Watts Bar Nuclear Plant in Spring City, Tenn. TVA soon will begin developing a new, 30-year plan for power generation that will rely less on coal and more on nuclear power. The Tennessee Valley Authority plans to start a nuclear chain reaction within its newest reactor this month as it moves toward adding the first new atomic unit to America's power grid in two decades by this summer. The startup of the Unit 2 reactor at the Watts Bar Nuclear Power Plant near Spring City, Tenn., will add 1,411 megawatts of carbon-free electricity generation, or enough power to supply two cities the size of Chattanooga. 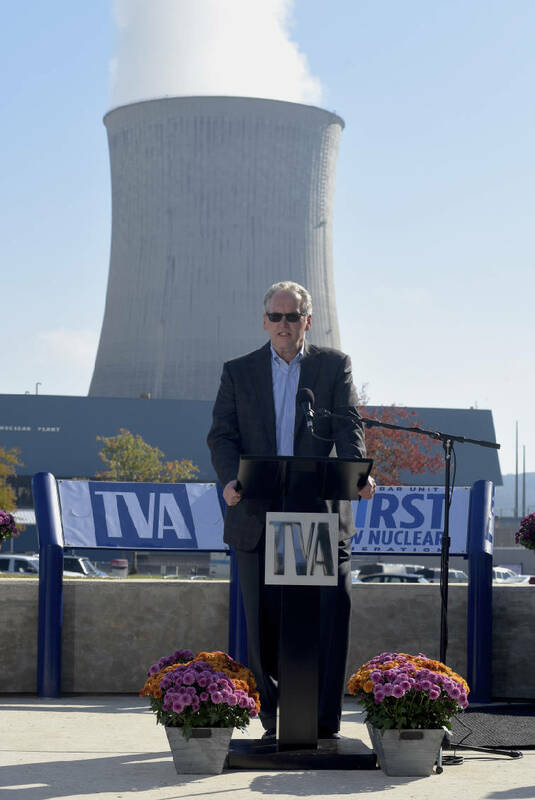 Although the $4.7 billion price tag for TVA's newest nuclear unit is only half that of other comparably sized new reactors, TVA President Bill Johnson said Tuesday it will still be more expensive than TVA's existing fleet of power and will tend to push up TVA's power costs. TVA president and CEO Bill Johnson announces last October that TVA had recieived an operating license from the Nuclear Regualtory Commission for the Unit 2 reactor at the Watts Bar Nuclear Plant. 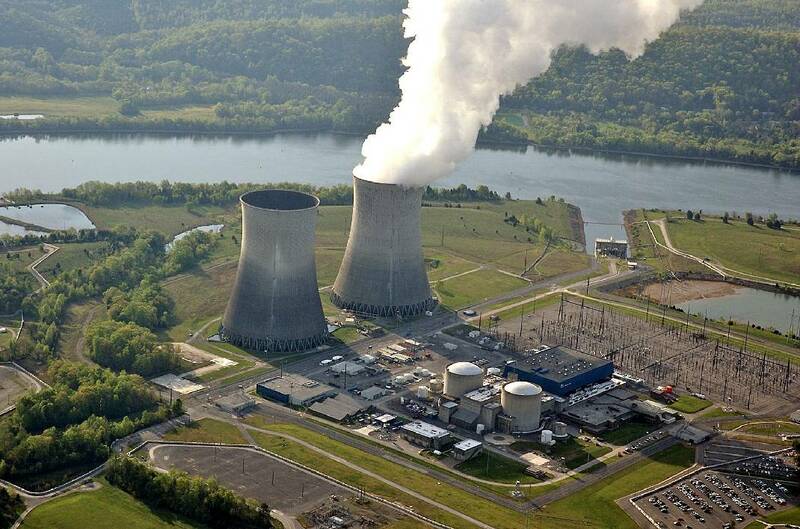 TVA said Tuesday the reactor should begin producing power in the next month. But Johnson said TVA customers should not experience any rate shock in absorbing the costs of the Watts Bar Unit 2 reactor, which has been under construction or some state of maintenance since construction began at Watts Bar in 1972. "At almost every case when you add a new generating resource, the incremental cost is higher than your system average cost and that will be the case here with Watts Bar," Johnson told investors during a conference call Tuesday. "But the system is so big and the average cost is so low that it won't have a big impact on rates and this [Watts Bar unit] will not have a substantial impact in and of itself." Once the newest reactor at Watts Bar is declared to be a commercial unit this summer, TVA will begin amortizing the debt and interest expenses incurred on the facility over the past 44 years. Combined with the costs of operating the new unit, the investment in Watts Bar will be included in TVA's rate base and likely impact power rates to be set by the TVA board in August for fiscal 2017. TVA Nuclear Chief Joe Grimes said Tuesday he expects the Unit 2 reactor to achieve initial criticality — the point at which a self-sustaining nuclear chain reaction occurs within the reactor core — later this month. After a couple of weeks of tests, the unit should begin low power production later this month and should achieve 100 percent production and be declared a commercial generating plant by this summer. The newest Watts Bar reactor will help TVA replace coal-fired generation that TVA recently has or soon will shut down at its Widows Creek, Colbert, New Johnsonville and Paradise fossil plants. Grimes said TVA encountered some problems at Watts Bar with a few of its pumps and valves during the testing of plant equipment, which delayed the startup of the new Watts Bar unit by about a month from what was planned when TVA got its operating license for the unit last fall from the U.S. Nuclear Regulatory Commission. But Grimes said the startup testing process has been similar to that of the 60 other commercial nuclear power plants operating across the United States. "Having participated in a number of plant startups, I think the timing has been very reasonable," Grimes said. "We want to make sure we finish this plant in as safe and reliable of a manner as possible." The NRC in March questioned the way TVA was handling employee concerns voiced by some operators at Watts Bar Unit 1 when the new reactor was being tested and work done for its completion. TVA acknowledged it needed to do better in promoting communication and a culture of excellence at the plant. Grimes said a meeting is being arranged later this month with regulators to help assess TVA's progress, but he said those concerns should not raise any public angst over the Unit 2 completion or TVA's attention to safety. More than 1,100 workers continue to be employed at Watts Bar Unit 2, although that number should be cut in half once the plant is finished, tested and begins its 18-month fuel cycle run. Anti-nuclear activists continued Tuesday to question the advisability of starting another unit at Watts Bar. "We remain as dubious as ever about moving forward with Watts Bar Unit 2, for both economic and safety reasons," said Louis A. Zeller, executive director of the Blue Ridge Environmental Defense League. "It just takes a millisecond to go from having a multi-billion-dollar nuclear asset to having a multi-billion-dollar-disaster when an accident happens." Zeller said the ice-condenser reactor building used at both the Sequoyah and Watts Bar nuclear plants in East Tennessee "are an accident waiting to happen." "Just because you give a 1957 Chevy some new wheels and a paint job, it isn't a new car," Zeller said, noting that Watts Bar Unit 2 was designed in the 1960s and has been under construction since 1972. But Grimes said TVA has upgraded and replaced key equipment throughout the plant to bring it up to current industry standards. ""We're very confident that we have a taken all of the experience of TVA and the industry to ensure this plant is built as safe as possible," he said.